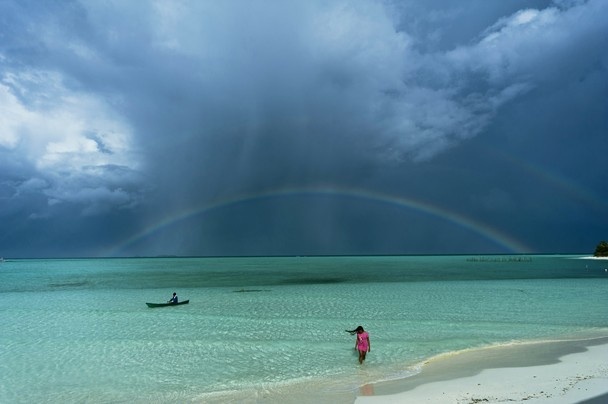 A double rainbow, a rainstorm pouring at sea, a lady in pink with her hair blown by the wind, a man in a banca, and a beautiful beach were among the elements that made up the winning entry taken at Onuk Island in Balabac, Palawan by veteran Filipino photographer George Tapan for a photo contest by the National Geographic. The judges of the panel comprised of wildlife photojournalist Tim Laman, influential nature photographer Peter Essick, and National Geographic photographer Amy Toensing chose Tapan’s photo as the winning entry for the ‘Places’ category, besting over 20,000 entries coming from 130 countries in the world. Two of the judges believed that the photo was “beautifully composed” – most especially seen in the detail of the woman’s windswept hair. The photo was actually taken while Tapan and his team were stranded in the island because of the rainstorm but it proved to be one of the best he has ever taken.